The Legacy Award, established in honor of the College’s 40th anniversary, was presented to Dr. Carolyn Farb on April 8, 2017, at the NSM 40th Anniversary IMPACT Gala. The award recognized the lasting impact she made to the College through the Quest for Excellence Gala. Funds raised at that event continue to support our faculty, and to date, have provided over 400 scholarships to NSM students. 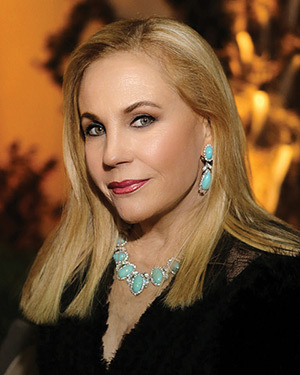 Dr. Carolyn Farb is a premier volunteer philanthropist, author and avid art collector. In 1999, she led the Quest for Excellence Award Gala that supported the University of Houston College of Natural Sciences and Mathematics. The gala netted over $3 million which led to the creation of the Eckhard Pfeiffer Professorship. The funds raised also have provided scholarships for over 400 students to date. Her commitment to volunteerism and philanthropy has helped many and set national standards. She has raised over $50 million benefitting several hundred charitable causes and non-profit organizations. Dr. Farb received her Honorary Doctorate in Humanities from Northwood University in 2003.